We wanted to integrate a grey water system into the new house design right from the get go. We experimented with a simple solution to collect the grey water from our old house and recycled the water from the washing machine. It was surprising how much grey water accumulates from just 2 or three washes a week, water that could be put to good use! Grey water (sullage) is essentially household ‘waste’ wash water from the kitchen sink, bath, shower, washbasin and washing machine. It is not water from the toilet or contaminated with feces or babies nappies. Greywater can contain grease, food particles, dirt, hair and some household cleaning products. Where possible we use natural or biodegradable soaps, shampoos and washing-up liquids. We buy these direct from the Grand Father Farm on Koh Chang Island. 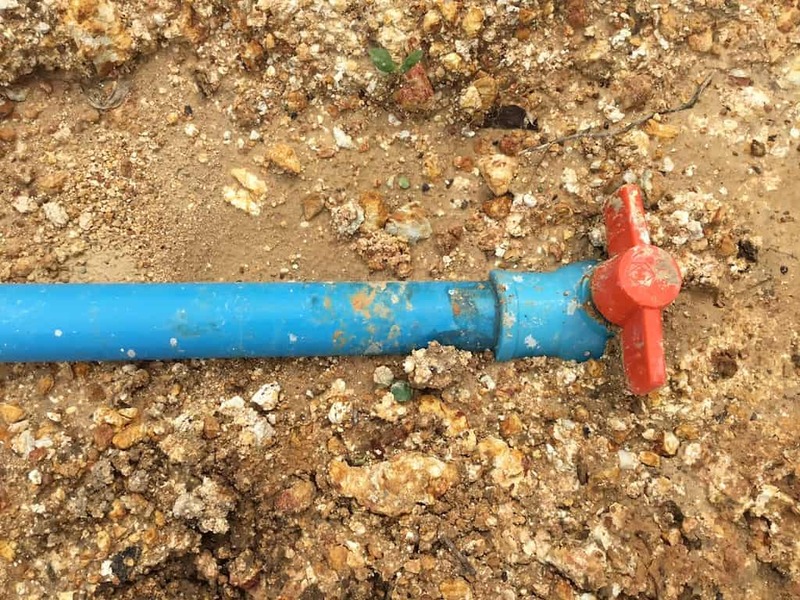 Grey water may look dirty but it’s a beneficial resource to irrigate our young fruit trees. We live in Thailand where for three to four months of the year the rain is scarce and the sun is brutal. Reusing this ‘waste’ water makes for common sense instead of just letting it run down the drain. 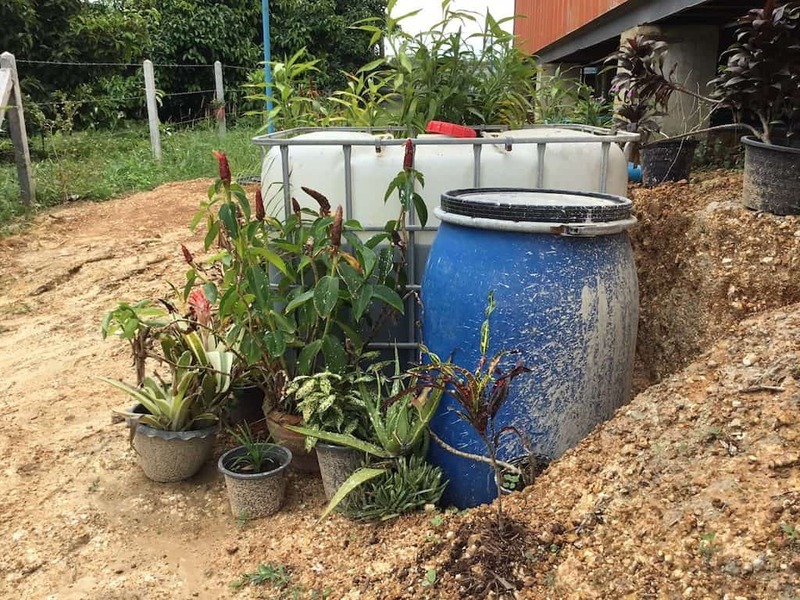 Collecting rain water in jars and ponds, having a well, growing with aquaponics and recycling greywater at home is all part of our closed loop water security system. When it comes to water management, you simply have to go with the flow and let gravity do its thing. We wanted a simple system to capture all the wastewater from the washing machine, kitchen and bathrooms. 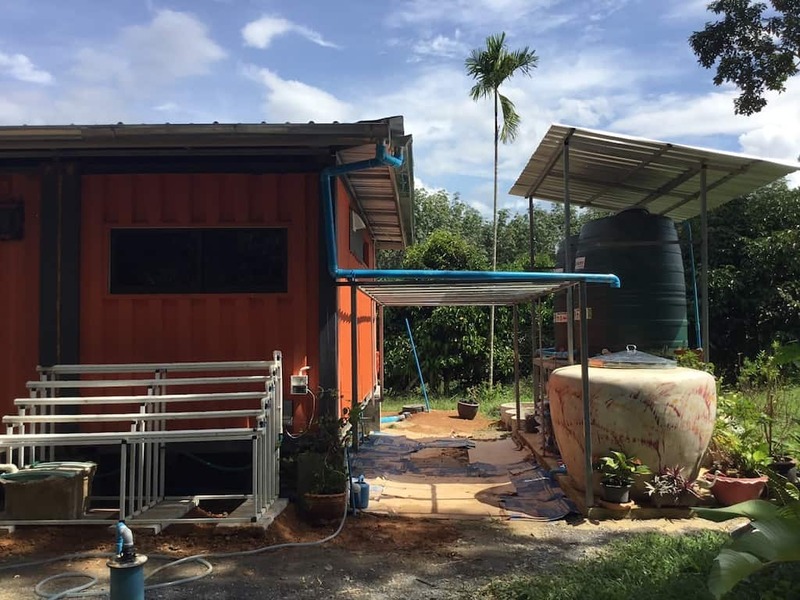 Our shipping container house is on piers so plumbing wasn’t such an arduous task. All the outlet pipes converge and gravity feed into a thousand liter IBC (intermediate Bulk Container) (the white tank). 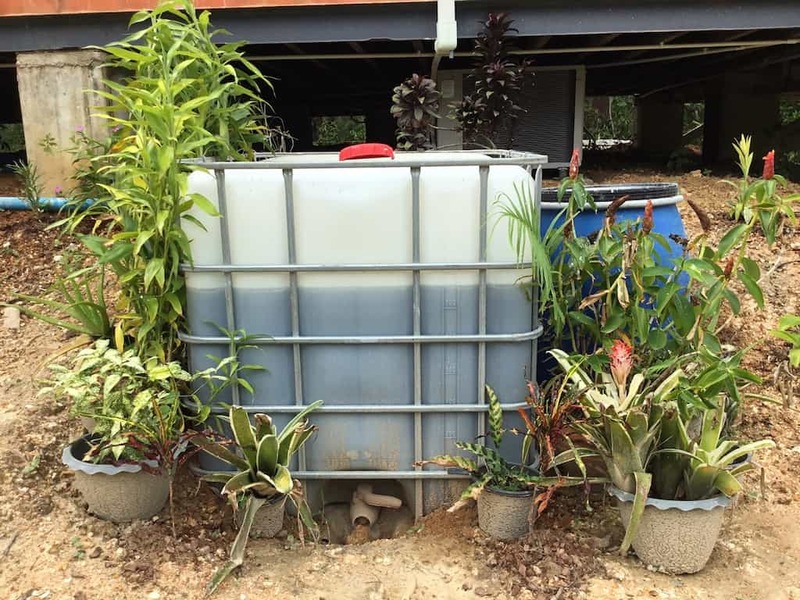 The grey water rises up and overflows into a second tank (the blue tank), which is fitted with a hose that we direct around the garden to irrigate our lemon, mango and papaya trees. Any sediment sinks to the bottom of the IBC, which from time to time can be cleaned out. 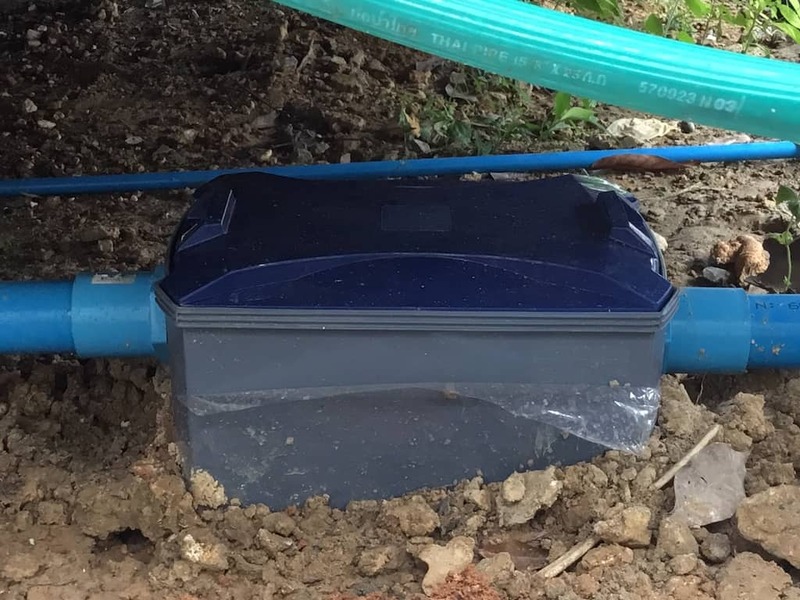 We also added a separate layer to the grey water system by adding an additional tank that captures any food particles directly from the kitchen sink. We are also using hand washing water to part fill the toilet cistern by having a innovative toilet design. Looks good, works well and saves on space too! We are collecting more grey water than we ever thought but we still have a team of builders working daily onsite. Hopefully, when they finish the volume of water, like by bank account, will diminish. Due to the volume of grey water we are currently collecting I’m going to add an overflow pipe to the blue tank so we don’t get back flow. 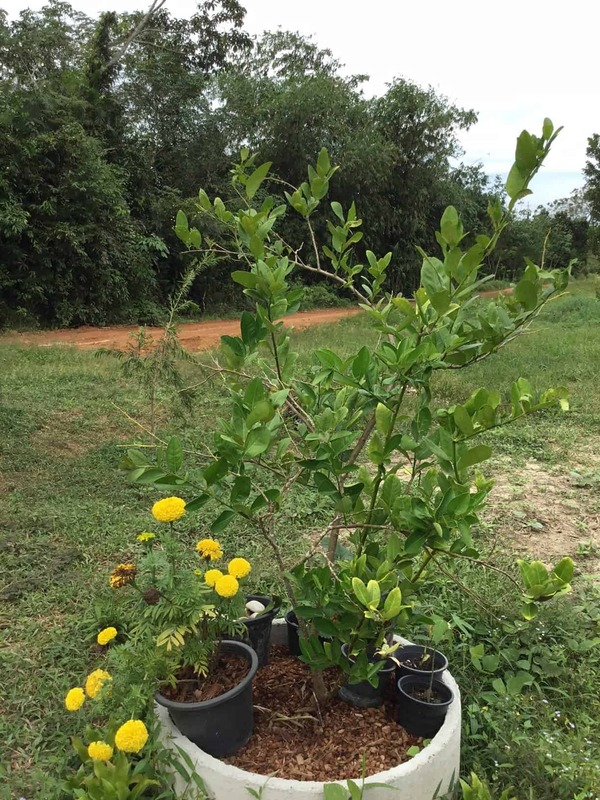 At the time of writing we have just come out of the rainy season so the new saplings need all the water they can get their roots on to get established. Grey water holds beneficial fertilizers the plants love and it also recharges the groundwater safely. In addition to the existing grey water system we plan to cut and plant out an area of the land and develop it in to a reed bed or wetland. This micro eco-system will add another dimension to the property and allow water-loving plants to flourish and attract more butterflies, beneficial insects and wildlife. One of the most surprising things I started to become aware of with this ongoing project is the interconnection between the systems we use and take for granted. 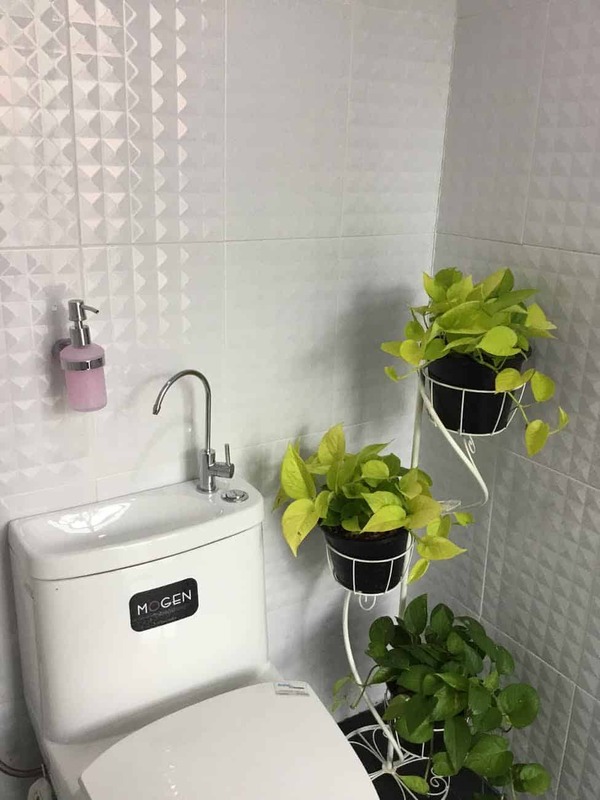 When I was living in the city, be it Bangkok or London I never gave water a second though, you turn on the tap or flush the toilet and water is there doing its thing. Only by setting up a grey water system at home did I start to understand the importance of this resource and how to effectively manage it. Do you have a grey water system? Let us know what you do to recycle or reuse grey water in your part of the world. Like this article or know someone who would? Please show Thinglish Lifestyle a little love and share with your friends on Facebook and twitter.